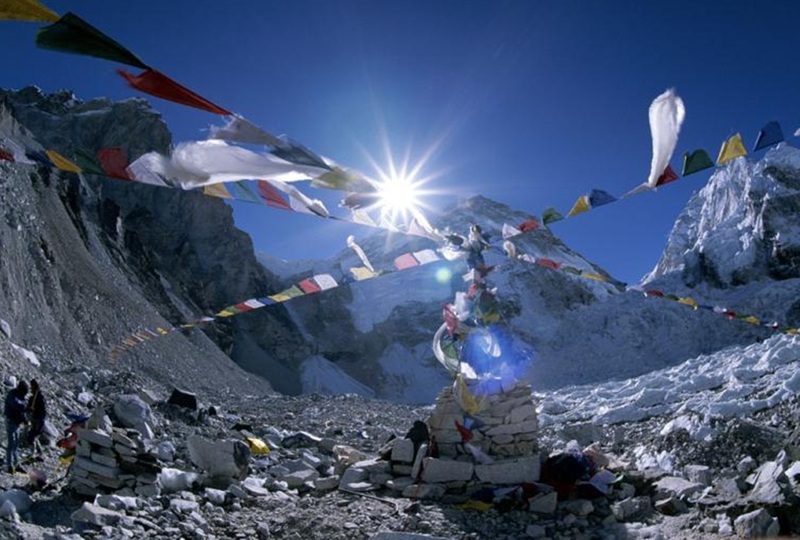 Everest Base Camp trek is a popular tour route in Tibet and the mere thought of Everest Base Camp nestled just a few kilometers away at Rongbuk is enough to heighten any trekker's adventurous spirit. Most of the time you will walk on a plateau over 4300m, even you will cross over one pass Nam-la 5300m, so this trekking route is a really difficult high-elevation, however, because of the high-altitude, it offers a splendour views of north face of Everest and other snow mountain peaks around. In this tour from Tingri to the Everest base camp, you traverse along the centuries old nomadic territories, fortified villages, alpine valleys, nomadic settlements, barley fields and succession of glaciated mountain passes. You are sure to get mesmerized by the surreally sculpted Rongbuk glaciers, on our way up to the Everest Base Camp. Scenic road-head drive to Kodari/Zhangmu from Kathmandu through the Arniko highway and return mountain flight from Lhasa to Kathmandu. Day 06 : Namche Bazzar trek to Tyangboche (3867m) 5-hrs. Day 09 : Lobuche trek to Gorakhshep (5160m) 4-5-hrs. Support truck to transport food, luggage and camping equipment.